One of the Don's and my favorite authors is the talented Michele Weber Hurwitz. We've loved (and reviewed) both her previous novels, Calli Be Gold and The Summer I Saved The World in 65 Days. So we were thrilled when Michele contacted us and asked if we'd be interested in revealing the cover for her new novel, Ethan Marcus Stands Up. You bet your socks we were!!! Michele also told us what she liked about the cover. Seventh-grader Ethan Marcus is fed up with sitting in school, and one day, enough is enough. He doesn't cause trouble or wander around, he just refuses to stay seated in class. His spontaneous protest doesn't go over so well with his rule-oriented teacher so Ethan is sent to the principal's office, and then is given two days of "Reflection" -- McNutt Middle School's answer to detention. When the faculty advisor suggests Ethan channel his energy into the school's Invention Day, at first Ethan says thanks but no thanks. He's never been a science-y kid. That's his Irish twin sister Erin's department. Except when Ethan and his friend Brian decide to give it a try, they realize they might have something. And it's good. Maybe great. But can they actually pull it off? 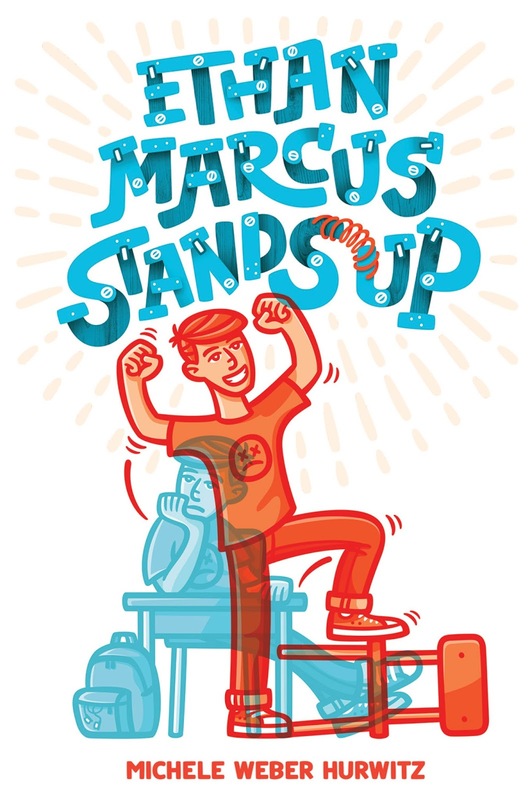 Ethan Marcus Stands Up -- narrated by five different kids -- shows how we all may have labels that define us, but that doesn't mean we can't step out of our comfort zone and attempt a new challenge. And, along the way, we may just learn from someone who sees the world from a different perspective. Middle Grade Mafioso: Well, I certainly can relate. Sitting is hard! The Don: What are you talking about? You sit around all day long. By the way, what's an Irish twin? MGM: (Googling) It means a pair of siblings born less than 12 months apart. The Don: Mamma Mia. I feel for their poor mother! He was, I could see, on the verge of a sermon. I whipped out Michele's new cover. Dear Readers, we are all seeing it for the first time. The cover was designed by Laura Lyn DiSiena and Hugo Santos. There are three elements I love about the cover. First, the bright colors really jump out and give it a fun, bold feel. Second, I like the double image of the boy. He's obviously unhappy sitting at the desk, then he's all smiles with his arms in the air and the chair knocked over, so I think readers will want to know what happened to change the situation. And third, I love the font for the title. If you look closely, there are nuts and bolts and a fun springy thing, as well as a wood grain look to some of the letters. This was meant to convey the feeling that making something is part of the story. I can't wait for ETHAN MARCUS STANDS UP to be released. The big day is August 29, 2017 from Simon & Schuster/Aladdin Books (hardcover). A sequel will be coming out in 2018. Dear Reader, What Should I Read Next? Boy, it's been a while since I read a middle grade book--due to the fact that my book group recently read Haruki Murakami's The Wind-Up Bird Chronicle. (Over 600 pages! 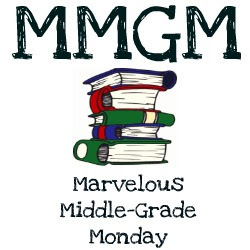 Definitely not middle grade!) I've also been working my way through The Artist's Way for a second time, and that's led me to check out all sorts of books on creativity. At this rate I'll need a new bedside table for the stacks! #1: It all began on one of those days--one of those stupid days when absolutely everything goes wrong. First thing in the morning, when Tom tried to put on his jeans, he found his darling sister had knotted the legs. #2: My little sister, Sam, knelt on the sofa, staring out the window. Our next door neighbors moved off base last week, and she was watching for our new neighbors to arrive. #3: Papi had pretty much promised to stop bringing Tia Perla to Saint Scholastica school, but when the last bell rings on a Monday afternoon, there she is just the same, waiting for me in the parking lot: Tia Perla, yet again. #4: On Monday, at exactly noon o'clock, our teacher, Mrs. Pellington, took us to the auditorium. She said there was a special surprise coming, but when we got there, we only saw other kids. It is a scientific fact that seeing other kids at school is not a surprise. #5: My dad always says "Charlie Bumpers, your closet looks like a tornado came through and decided to live there."